We are all ready for some spring right? So today I´ll take you to visit Klara Ripa´s old apartment. 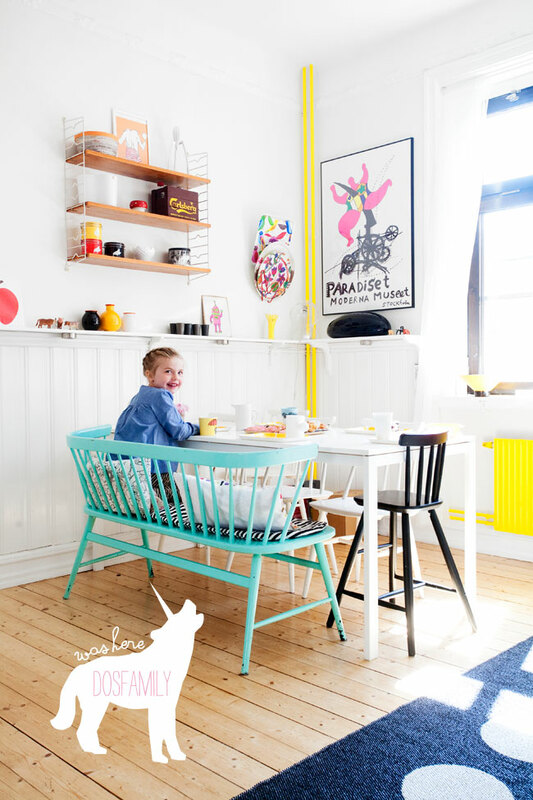 Klara Ripa is the creative and fun spirit behind the blog Pippivogel. I photographed the apartment in the month of May when the cherry blossom bloomed in the back yard. Since this shoot Klara´s life has changed quite a lot and the family has moved, but on that day it looked like this. Above: Elise in the kitchen flooded with sun light. I am crazy about that radiator painted yellow. Elise is such a doll, she made us loooooonnng straws and set the table for our coffee break. View from the kitchen. There are quite a few back yards in Malmö that have been blessed with cherry blossoms. Paper on string that Klara made. This cabinet used to have wallpaper but the kids kept pulling it down. Klara is the queen of self adhesive vinyl. I love what she ´s done to this chest of drawers. I have photographed more of her vinyl here. Klara´s brother Axel Ripa transformed these ordinary farm animals into pieces of art! Sander got a snack in the kitchen now he´s back for more Pippi Långstrump on TV. Long lashes because you´re worth it. Above Klara hangs more artwork from her brother Axel Ripa. No chest of drawers is left untouched at Klara´s place. Clothes of two color full kids. WOW WOW WOW! what a fun happy cheeful home! Love it! It gave me a lot of inspiration! This home is great! I love the geometric shapes and big windows. I don’t like curtains or anything that covers windows, as they limit the space so I love the paper chains in the window. I’ll try to do something similar at my home. Thank you for inspiration!!!! Alla glada färger får mig nästan att skutta! Helt underbart att se! The Queen of vinyl! Very very nice! Still love those yellow pipes such a great idea! really love the turquoise bench, and that triangle rug is amazing too! Jag känner mig nästan vindögd nu, av att försöka insupa allt färgglatt ögonbildgodis! Ett inlägg att återkomma till flera gånger och riktigt njuta av alla detaljer. Long lashes because you’re worth it! Haha, så bra. This place is rad! I was a sign maker for several years… so vinyl is practically in my blood. Love all the geometric designs and colors you guys use… you don’t see anything like that here in the middle of the U.S. Everything here is beige, tan, cream…. BLAH! So glad to hear you like it. En dos vår. Så fint och välbehövligt! Hi the place looked great and your while site is the most inspiering i’ve fould. I’ve been trying to find a yellow like the pipes bit can,t get it right. No chance of geting a color code? I think the High chair is from Ikea. And the rest is second hand. they are called String. Very common here in Scandinavia. Hur du kan dölja en ful bård på kul sätt! | Badrumsdrömmar – bloggen för dig som älskar badrum! Fråga: Fräsch upp badrummet för 5000:- | Badrumsdrömmar – bloggen för dig som älskar badrum!